There’s been some big news out of China lately, and today we’ll dive deeper into the discussion when I welcome in Gordon Chang. Mr. Chang is one of the foremost experts on the Chinese economy and has written a book titled The Coming Collapse of China. He’ll tell us why he believes an epic collapse is imminent and what it all means for the Western financial world and why he believes there is what he calls a Chinese floor on the gold price. Don’t miss an incredibly enlightening interview with Gordon Chang, coming up after this week’s market update. Precious metals markets are pulling back for a second straight week on follow-through technical selling. Gold ran into resistance at the $1,300 level last week, and prices have since retreated by a little over $30. As of this Friday recording, gold trades at $1,269 an ounce, down 1.6% on the week. Gold’s more volatile relative, silver, looks lower by 2.7% this week to trade at $17.06 per ounce. Platinum is off 3.4% to trade at $1,045, while palladium shows a weekly loss of 3.1% with prices currently coming in at $592 an ounce as of this Friday morning recording. Metals markets are correcting after being propelled upward by an explosion in investment demand in the first four months of the year. On Thursday, the World Gold Council released its latest quarterly gold demand report. According to the report, global gold demand surged by 21% in Q1. Total gold demand came in at 1,290 tonnes, the second biggest figure ever for a quarter; this, despite weak industrial demand and falling jewelry sales. Jewelry is normally the biggest driver of consumer demand for gold. But this year investment buying is almost single-handedly driving the gold market. According to the World Gold Council, gold investment demand skyrocketed in the first quarter by a record 122%. Exchange-traded products such as the iShares gold ETF received so many investment inflows so quickly that at one point they had to suspend the creation of new shares. Sales of gold coins are also going through the roof. The U.S. Mint reported that sales of Gold Eagles in April 2016 ran at double the pace of April 2015. Demand for Silver Eagles is also coming in brisk, with the Mint selling more than 4 million of the coins in April and 20 million year-to-date. Last year, the Mint sold a record 47 million silver ounces worth of Eagles – and that’s with the Mint repeatedly selling out of coins and being unable to provide dealers with adequate supplies of its products on numerous occasions. We appear headed for another new record this year unless the Mint puts some artificial brakes on Silver Eagle demand through continued rationing. Silver Eagles always carry a slight premium to privately minted rounds. Sometimes that premium expands when Eagles are in relatively high demand and short supply. It’s not necessarily a bad move to pay a little extra for Silver or Gold Eagles. You’ll be able to get back some of that extra premium when you sell. But you generally don’t want to buy American Eagles when premiums are elevated, since they could contract back to normal levels by the time you want to sell – or need to sell. Platinum Eagles are hard to come by, as the Mint stopped regularly producing them in 2009, although there has been talk that the Mint will release some 2016 dated Platinum Eagles at some point this year. In the meantime, investors seeking diversification into platinum and palladium bullion should look instead to Canadian Maple Leafs or 1-oz bullion bars. Now is a good time to take a look at the platinum group metals, as they have gotten cheap versus gold and silver over the past couple years. The platinum-to-gold ratio has turned up slightly in favor of platinum in 2016, but platinum remains in bargain territory historically speaking. It will continue to be a relative bargain as long as platinum commands a lower price per ounce than gold. Currently, gold commands a $220 premium over platinum. A great way to get started in platinum and palladium or precious metals in general is through the new PAMP Multigram Portfolio. Money Metals now offers this unique new product, which contains small gold, silver, platinum, and palladium bullion bars in one handy package. Each pack contains 4 bars of each metal in the barter-ready 2.5 gram size. The package is designed to be separated into 16 individual sections, each containing a bar marked with the PAMP name, serial number, weight, and purity. These Swiss-made bars are second to none when it comes to quality and security features. They carry PAMP’s proprietary Veriscan technology to assure holders that the bars are genuine and untampered with. The microscopic topography of each bar allows PAMP to assign an identity as unique as a human fingerprint. Bars can be scanned again later for verification. PAMP Suisse bars are also famous for their beautiful designs. The front of each gold, silver, platinum, and palladium bar features Lady Fortuna, a Roman goddess representing fortune and luck. To add a little flare to your holding, consider investing in any of the PAMP Suisse bars now available from Money Metals Exchange thanks to a new partnership. To view all of the new PAMP products we now carry and for up to the minute pricing on these or other items, check out our website at MoneyMetals.com or give us a call at 1-800-800-1865. And remember, no matter what you choose to buy, shipping and insurance are now free on any $1,000+ order. Mike Gleason: It is my privilege now to welcome in author, lawyer, television pundit, and Forbes columnist Gordon Chang. Gordon is a frequent guest on Fox News, CNBC, and CNN and is one of the foremost experts on the Chinese economy and its geopolitics and has written a book on the subject called The Coming Collapse of China. Gordon, it's a real honor to have you on with us today. Thank you very much for taking the time, and welcome. 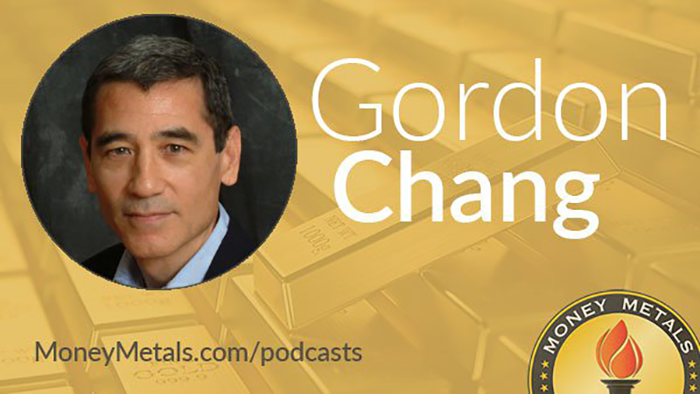 Gordon Chang: Thank you, and it's a real honor to be on your podcast. Mike Gleason: Before we dig into some specifics here, Gordon, China's economy is now the second largest in the world. They’ve been reporting GDP growth at 7% to 10% per year for decades, and we've all heard stories about their booming economy. But few Americans have been there and probably don’t really know what's going on. The Chinese government is notorious for managing statistics and controlling information, so it can be difficult for U.S. investors to get the real story. That’s why we're very excited to get your insights today. You’ve spent time in China, you are of Chinese descent, and you’ve been studying their economy for decades, so you have a unique perspective on what is really happening there. So to start out here, talk about the current state of the Chinese economy as you see it and where it might be headed. As people listening have probably already gathered, based on the title of the book you wrote, you aren't all that optimistic about what's going to happen there. Tell us about that as we set the stage here. Gordon Chang: The official National Bureau of Statistics says that the Chinese economy grew 6.7% in the first quarter of this year, 6.9% in 2015. I think that those numbers are over-statements. So for instance, in Q1 they might have been growing 3% or 4%, but maybe even less than that. In 2015, it was a tragic story because you start looking at some of the indicators, you see the contraction of the important manufacturing sector. You see consumption growing a little bit, but not that much. And still, the most reliable indicator of Chinese economic activity is the consumption of electricity, and in 2015, electricity consumption grew but only by 0.5%. The country was in deflation in 2015 with nominal GDP at 6.4% and real at 6.9. That’s really difficult to reconcile with an economy growing in the higher single digits. So I think China has got a problem right now because essentially, Chinese leaders no longer have the ability to create growth. This is an economy that’s trying to trend down, and eventually, it will start to contract. Mike Gleason: The Chinese have made some large trade deals with nations such as Russia and Brazil to buy oil and gas and make payments in yuan rather than U.S. dollars. In addition, China is growing its reserves of both gold and silver. Now you told me off-air that you don’t think a currency war is something China should even consider engaging in based on all of their economic issues, but you have to wonder if they're trying to position the yuan as an alternative to the dollar nonetheless. Heaven knows, there may be an opportunity there. The U.S. dollar looks less and less like a bastion of strength. Kenneth Austin, an economist at our own Treasury Department, wrote a 2014 op-ed in the New York Times declaring that the burden of the dollar's reserve currency status is one we can no longer afford to bear. Maybe a currency war won't be necessary and officials here will willingly step aside. What are your thoughts? Should we expect a major push by China to supplant the dollar with the yuan any time soon? Maybe it will be a failed attempt, but is that something they're positioning themselves for, Gordon? Gordon Chang: Well clearly, the Chinese want the renminbi to be the world's reserve currency. They'd like to shove the dollar aside. The problem, though, is that it is a weak currency right now. Donald Trump might be right that they're currency manipulators, but they're not manipulating the currency down to gain an export advantage. What we have seen, especially since August of last year, is that they are supporting their currency. So this is a problem for China because the last thing that they should be trying to do right now is to internationalize the renminbi. And the reason is when they internationalize it, they start to lose control over it, and that’s exactly the wrong strategy when you have an economy in distress. They have had a lot of money, and they’ve lost actually a lot of money out of their reserves, much more than I think that they're willing to admit. This is the wrong thing for them to do, at least at this particular time. Mike Gleason: It's often discussed how the Chinese are culturally more forward-looking. They plan decades ahead, not just a few months or years. If that is true, one might think that they would have an advantage and avoid some of the traps Western governments have fallen into, but they seem to be making many of the same mistakes. Markets are anything but free. Last summer, officials attempted to prevent a collapse of their stock markets by threatening to arrest anyone selling shares, the antithesis of free-market conditions there. They’ve accrued massive debts and they have an activist Central Bank printing, monetizing debt, et cetera. Are Chinese officials really better at strategic planning and longer-term thinking, Gordon? Gordon Chang: I actually don’t think so, especially what we saw starting in the second week of July when they started to introduce their support measures for the equity markets. And then, of course, the still inexplicable devaluation of the renminbi, starting August 11. Chinese technocrats show themselves to be less than fearsome and less than competent. So I think that we sort of attribute to them mythic qualities which they don’t really deserve. Eventually, they will be able, I think, to stabilize their economy, and they’ve been trying to do that right now, but as they do that, they incur a lot of debt. They're still experiencing large capital outflows. So right now, although it looks like they were able to at least staunch the problems, they have some challenges I don’t think that they can meet. Mike Gleason: Certainly, the information that comes out from the Chinese government is very controlled. I think now, I've heard just even recently that if you speak ill of the government's provided statistics that they’ll send you to prison or try to prosecute you in some way. This is just the opposite of what a free market looks like. What are your thoughts on that? I know this is something that’s been going on for a long time, but they don’t appreciate dissenters, do they Gordon? Gordon Chang: No, they certainly don’t. The Wall Street Journal report that you referred to where they're trying to infuse a little positive energy into analysts. As we all know, beginning July of last year they criminalized many forms of trading. They did a lot to prohibit institutions from selling. They just at this point, that’s sort of like the last refuge of a technocrat, where they're trying to browbeat market participants and analysts. So I think that that’s an indication that the end is quite near because they’ve just run out of solutions. Monetary policy just hasn't worked. Fiscal stimulus is adding to their debt woes. They do all of these things and you still have the large capital outflows, perhaps as much as $1 trillion last year, according to Bloomberg. So I think these are desperate technocrats and desperate leaders who at this point don’t know what to do and are just playing for time. As they play for time, they make matters worse, because we saw that extraordinary increase in credit in March. It had very little effect on the economy. It's a dead panda bounce. Now, I don’t think that they know what to do except to try to imprison people who don’t say nice things about China's economic potential. Mike Gleason: I'm curious. How do the Chinese view the American political system as a whole and also the Obama Administration? And how do you think they view Hillary and Trump, since it appears that one of them will be succeeding Obama later this year? What's the general mood about American politics in China? Gordon Chang: Well there are a lot of Chinese, so maybe there's no general view. Of course, the Communist Party is extremely negative about all things American. So you're not going to hear nice things about the American political system from an authoritarian one like China's. Chinese people, though, are very interested. They have means of information. They can climb over what's called the great firewall. There is a lot of discussion all the time about what goes on in the American political system. Right now, as you point out, people are talking about both Secretary Clinton and Donald Trump, and it seems to be pretty evenly divided about what they think in terms of who they favor to be the next American president. There's a lot that’s going on there. Donald Trump, as you'd expect, has a lot of detractors in China, but he also has a lot of supporters. The thing that I just take away, and this is a general thing ... my wife and I went to my dad's hometown in early 2008 because we wanted to know about what people thought on the Olympics. But people didn’t want to talk to us about that, which they derided as the “Government's Games”, which really surprised me. What they wanted to talk about was who was John McCain, who was Barack Obama, and how, this is really surprising, how did the concept of balance of powers work in the American Constitution. So people there are really focused in on the United States as an alternate model for China. And although the Communist Party will never want that, nonetheless, I think the Chinese people certainly want more say in their lives and they're willing to learn from others, which I think is a very important sign of a vibrant society. Mike Gleason: The Chinese government does seem to maybe nudge their citizens to purchase gold and silver as a way to protect themselves. Does that resonate with the citizenry there? Are they accumulating precious metals at a personal level just because there's an affinity for it, or are they just going along with what the government is telling them to do? What can you say there? Gordon Chang: Yeah, I think the Chinese people are acquiring precious metals, but especially gold. But it's not because they're nudged by the government. I think they're doing it because there's concern about their currency, about their economy, and also about the signs of discord in the political system. So you have people buying gold. This is an easy way of capital flight, in effect, because if people can't set up a tax haven company in Panama, for instance, just to take an example, the one way to protect your assets is to buy hard metals. So therefore people buy gold. Now, of course, the Chinese have an affinity for gold, have had for centuries, but now I think the demands are actually much higher. There's a lot of gold-buying by China. Some of it must be from the Central Bank, but I think a lot of it is by individuals who are concerned about the trajectory of their economy and, indeed, of their country. Mike Gleason: Are we to believe the reports, Gordon, about how much gold the People's Bank of China is accumulating? And if not, do you think they're under-reporting it or over-reporting it? What do you think about China's gold hoard and what they’ve been telling the world about those figures? Gordon Chang:For a very long time, the People's Bank of China was telling us that there was no change in China's gold position. Then about a year or so ago, they announced a big increase all in one month. So obviously, their reporting is inaccurate and unreliable. I don’t know exactly, but my sense is that they are under-reporting their acquisition of gold. I can't point you to anything, but it's just a sense of where Chinese government policy is going. I don’t know what purpose that is for. People talk about eventually a gold-backed renminbi. I don’t think that they're thinking about that, but nonetheless, when gold dipped in price, they saw a buying opportunity and so, therefore, they did stock up on gold. And we can expect them to do that at other opportunities when gold declines. So there's going to be essentially a Chinese floor to gold, largely because of central government buying. But also, as I mentioned, just Chinese individuals will rush in to buy the precious yellow metal when they see that it's cheap. Mike Gleason: The Shanghai Gold and Silver Exchange was introduced last month. It provides an alternative to the COMEX and other Western exchanges, which many believe are massively over-leveraged and highly controlled by the banks, some of whom have recently admitted to rigging prices. But investors need to be careful assuming the Shanghai Exchange won't be subject to problems of its own. What do you think the ramifications of the new exchange in Shanghai might be for the metals markets, and what do you think was behind the decision for the Chinese government to launch this competing exchange? Gordon Chang: I think the decision behind the launch is what you talked about before, and that is a general attempt to internationalize the renminbi and also to increase China's influence in markets generally. As I mentioned, I'm not so sure how long that they’ll be able to continue with this initiative, largely because of severe problems in their own economy, but, as you say, they are long-term thinkers, so that’s what they're trying to do. As I mentioned, this is probably the wrong time for them to do that, and so therefore, they're increasing volatility in their own currency and in their own markets. So this really is maybe a good move strategically, but tactically, couldn’t be a worse time to do it than now. Mike Gleason: As we begin to close here, Gordon, what should the key takeaway here be, because I know you're expecting not only a collapse of the Chinese economy and their current way of life, but an epic collapse? China is now a major player in the global economy, but if the bubble bursts like you expect and in such an incredibly disruptive way like you expect, what are some of the ramifications of that happening? And more importantly for those of us listening today, how might that collapse affect those of us in the Western world as well as the global financial markets? Gordon Chang: We saw, for instance, last August where essentially unimportant news out of the Chinese economy, which was news out of a private survey of the manufacturing sector, how that erased something like $2.1 trillion in value off the Dow within six trading days. So you can imagine what a big failure in China is going to look like as it rolls through the global financial system and the global economy. China actually is less important to the world than most people think, but nonetheless, with an image of it as being so large, then, of course, it is going to bring down most everything else with it. I think the important thing is to understand China's role in that economy so that we will be prepared when it occurs. We know that the Chinese are, for instance, accumulating debt at least four times faster than nominal GDP, probably a lot faster than that. That's completely unsustainable. There will be a crisis. We don’t know when that crisis will occur, but we also know at some point, China will not be what it is today. Mike Gleason: How about the future of the Chinese Communist Party? I think I've seen you say somewhere where you're expecting just mass riots and so forth as things unfold there in China. What do you think the ramifications are there? Gordon Chang: I don’t think the Communist Party will survive the economic crisis in China, largely because for about 35 years, the primary basis of its legitimacy has been the continual delivery of prosperity. And without prosperity, the Communist Party is going to have a hard time navigating that. Right now, Chinese technocrats don’t seem to be doing a terribly good job. We see fighting between Xi Jinping, the General Secretary of the Communist Party, in other words, China's ruler, and Li Keqiang, who is the Premier, who is supposed to be the economic czar. This is, I think, an early indication of what things will look like as the economy tends to trend down, as it has to. Although Chinese technocrats can postpone the application of the laws of economics, they have not been able to repeal them, and because of that, we know that there's got to be some adjustment. That adjustment will be large because the imbalances in China are large, and because of that, the Communist Party, I believe, will not survive the coming crisis. Mike Gleason: It's certainly going to be interesting to watch this play out. China gets a lot of attention throughout the world, as you mentioned, and if we do see an implosion of that economy, there's going to be a lot of shock waves, I think, throughout the rest of the world. Well Gordon, it's been a truly fascinating conversation, and I really enjoyed it. We've been talking a lot about what's been going on with China of late, and it's great to have had a chance to speak to an expert like yourself about these matters. We wish you continued success with the book and would love to have you back on in the future as all this unfolds. Thank you again and hope you have a great weekend. Gordon Chang: Thank you so much, Michael. Mike Gleason: Well that will do for this week. Thanks again to Gordon Chang, author of the book The Coming Collapse of China. Be sure to check that out. And check back here next Friday for our next Weekly Market Wrap Podcast. Until then, this has been Mike Gleason with Money Metals Exchange. Thanks for listening and have a great weekend, everybody.